If you’re a mechanic you already know that the tools you own are the most important part of your job. If you don’t have the right tools it definitely makes it hard to get the job done. But if you can find the best tool sets for mechanics, you’re going to be off on the right track. You’ll be able to take care of just about any job and you’ll be able to do it more easily too. After all, those tools allow you to use more strength than what you have on your own. Case: Does the set come with a case? This isn’t always a necessity and maybe you already have a case for your tools, but this is going to help you store everything neatly. It also keeps everything right where you want it. Pieces: How many pieces are included in the set? This is going to impact just what you can do with the tools you get. Are you getting a lot of pieces or just a few? This is about the personal preference and value for your money. Measurement Method: What type of measurements do the tools use? Any type of tools will use either metric or standard or possibly both. Look at the type of work you’re doing and use that to figure out which tools you need. Magnetic Handle: Are the handles magnetic? This can make it easier to pick up small items and pieces that fall while you’re working. It’s not a necessity, but it’s definitely going to help you along when you’re on the job. Socket Sizes: What sizes are the sockets that you’re getting? The sizes are about what they’re able to do and they’re definitely going to be important. Just make sure you consider what work you do to what you need. Warranty: A warranty means that the company is going to stand behind their products and that’s always important. You want a long warranty that lets you know what you’re getting is actually built to last. You want the best mechanics tool set and that could mean doing a whole lot of work, or you could take a closer look at the different options we have here. These are all great toolsets that are going to make it a whole lot easier for you to get any job done. They’re going to help you with different tasks and they’re going to get you a whole lot closer to that complete collection of tools that you need. That way you can work on any projects that you might have, for your vehicle, your job, your home or anything else. 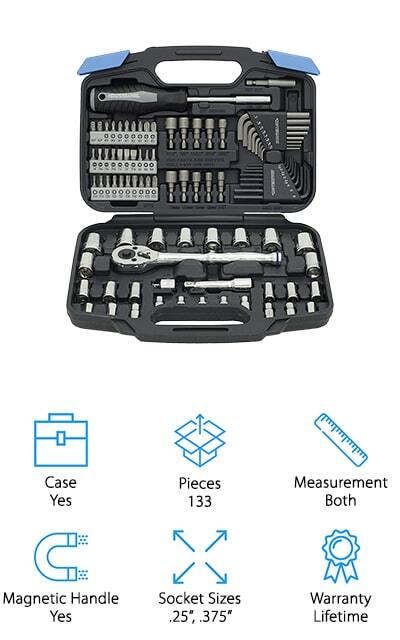 You’ll have possibly the best mechanic tool set when it comes to anything Craftsman and you’ll definitely have a great auto mechanic starter tool set with this one specifically. 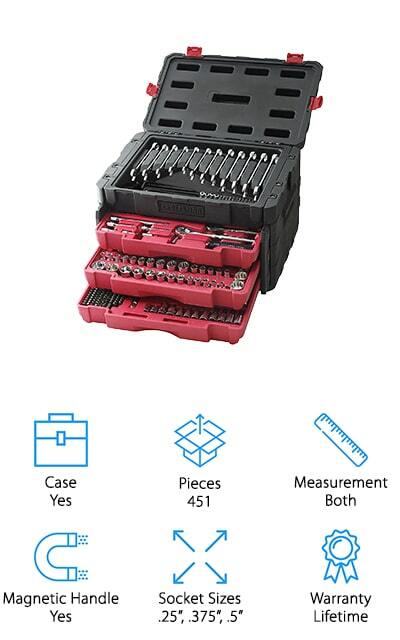 This set gives you 450 pieces that include all different sockets, wrenches and more. It’s designed with both metric and standard sizes so you can use it with just about anything you’ll come into contact with and it has a lifetime warranty. The whole thing even comes with a case that lets you store everything away easily and take it with you wherever you might go. The magnetic handles also make it easier to connect the sockets and to pick up lost screws or pieces. Altogether that means you’re going to be ready for just about any project you want to do next. Our budget pick is still a great auto mechanic tool set, it’s just a little bit smaller. You’re going to get a full 170 pieces here, that comes with a case, screwdrivers, sockets, wrenches and a whole lot more. It’s filled with both standard and metric sizes in just about every size you could need. Plus you get a magnetic handle to the pieces that let you connect them more easily and lets you pick up smaller items as well. You’ll have all the tools you could possibly need for just about any job right here. What’s really great is you get a full satisfaction guarantee and you get a lifetime warranty that says you can count on these tools to last. All you need to do is store them away and take them with you wherever you might need to go to get the next job done. 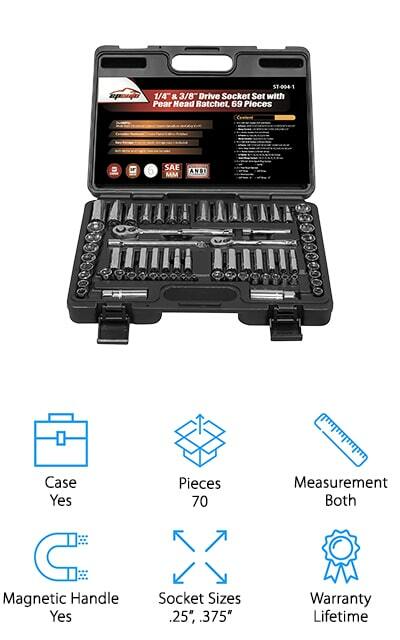 This could be the best mechanics tool set for the money and it’s made by a company that’s definitely well known for a range of tools. 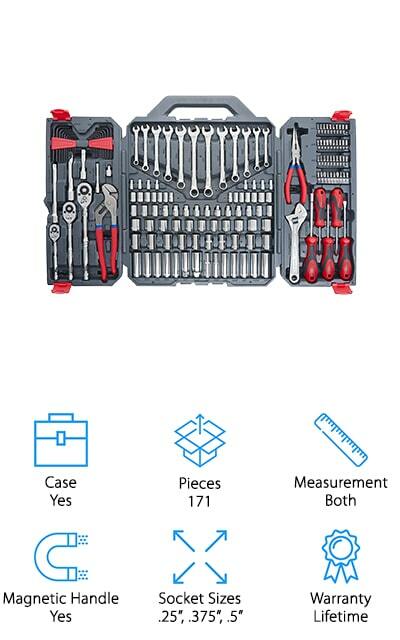 In fact, it might be the best mechanic tool set brand. You’re getting a total of 168 pieces that include wrenches, sockets in both standard and metric and a whole lot more. You’ll also have a case to carry everything around in so all you have to do is pack it up and take it along. There’s a lifetime warranty included with this set, so you know that it’s going to last as long as you need it and the lever design is great for torque ratcheting and for single hand use, so you don’t have to put as much effort into it to loosen up those bolts. 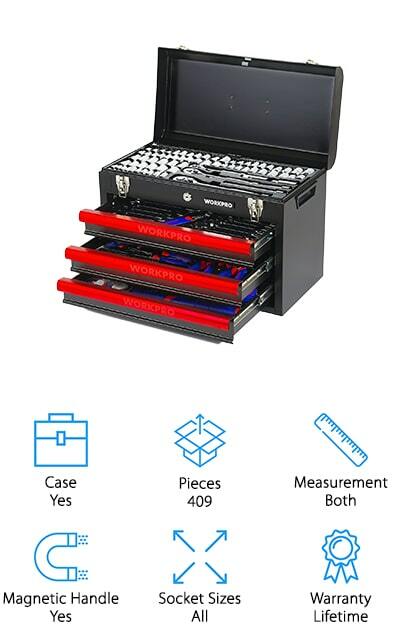 This diesel mechanic tool set actually comes with a full tool box that has 3 separate drawers for you to store everything in. There are over 400 pieces here that include pliers, screwdrivers, ratchets, wrenches and a whole lot more. You’ll also have sockets that are both standard and metric so you can get in there close with any type of tools you may need. You’ll have magnetic handles to help connect the sockets and to pick up small pieces and you’ll know you’re getting everything you need to get started. There’s a full lifetime warranty on this set and since they’re made with chrome vanadium, they’re designed to be strong and durable. You’ll also have a polished chrome finish that makes sure they’re not going to corrode while you’re using them. 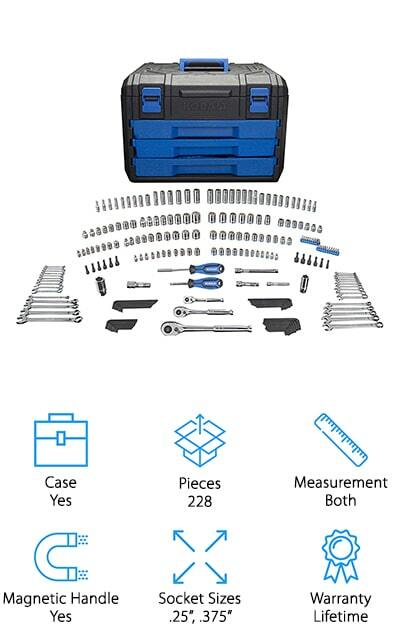 This mechanic tool box set comes with 200 pieces that include ratchets, wrenches and plenty of sockets that are both metric and standard. That means you can get just about any job you want done. You’ll also have regular and deep sockets and combination wrenches so you’re getting versatility with everything. When you’re done with the job you can pack everything up in the case that comes with it and you’ll be able to transport it wherever you need to go next. The warranty lasts a lifetime, which means you can count on these pieces to be high quality and to last you a long time. They’re made with steel and they’re made by a company that’s well known for high-quality products and more. This isn’t a Craftsman master mechanic tool set but it might be the best starter mechanic tool set you’ll find. You get a full 800 pieces so you’re going to be prepared for anything that comes your way. There are standard and metric sockets and wrenches in just about any size you could possibly need. You’ll even get gloves and plenty of additional tools to take care of different projects. The tools have magnetic handles that allow you to pick up small pieces or attach your sockets more easily and you’ll have a suitcase design that makes it easy to store everything. When you’re done with a project you can easily pack up the case and wheel it away just like your normal case. You’ll also have latches with keys to make sure that no one else is going to get into the case when you’re not around. 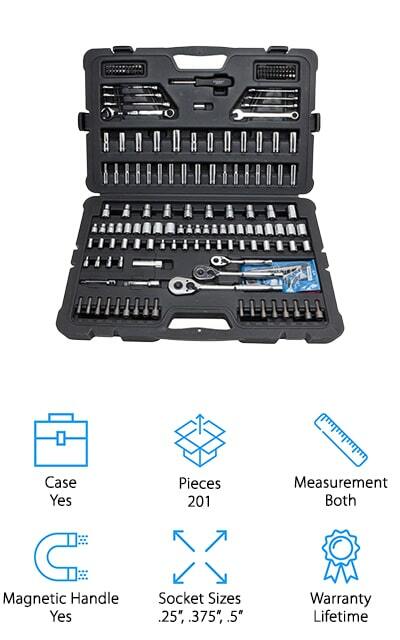 This full mechanic tool set gives you over 220 pieces that you can use for just about any project, including standard and metric sizes. On top of that, you’ll have the most commonly used 6 and 12 point sockets as well as extensions, combination wrenches, ratchets, hex keys, and other assorted tools. That means you’re going to be ready for just about any project that you need to do around the house, with your vehicle or at work. There’s a lifetime warranty that says this set is going to last you a very long time and the tools are all made with a chrome vanadium steel that definitely backs that up. You’ll even get quick-release buttons on the ratchets to allow for quick socket changes. This mechanic starter tool set is a little smaller than some but it’s definitely going to give you some of the basic tools that you need to get started. It has both standard and metric sizes of everything you need and offers 2 different common socket sizes. You’ll also have a pear head ratchet to make it easier to use. The corrosion resistant chrome plating keeps your tools in the best shape possible and the mirror polish makes sure they look great. You’ll get a case to hold everything and you’ll definitely love all of the extras that are included here. You’re going to have everything you need to get most of your jobs done and a perfect set to get you started off. This small motorcycle mechanic tool set gives you almost 70 different pieces that will help you get most any job done. It’s all standard sizes and gives you plenty of different sockets to get into just about anything. You’ll get a quick release ratchet as well and several of the accessories that you need in order to really be able to use it. Some of your most common hand tools are even included in this set so there’s no reason for you to be low on anything. This set comes with a full lifetime warranty that lets you know you’re in for some high quality and durable materials. You’re also going to enjoy using them for more than just motorcycle work. You can use it for all kinds of jobs around the house as well. 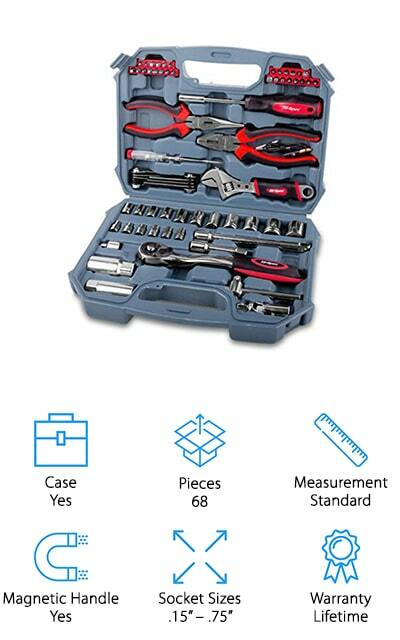 This isn’t just a metric mechanic tool set but also a standard tool kit. 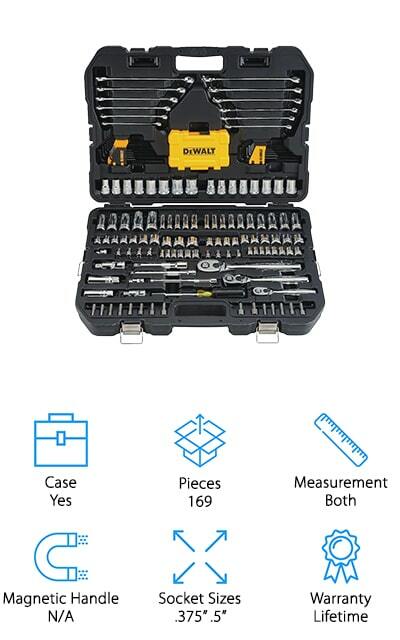 It comes with over 100 pieces that include ratchets, sockets, extensions, adapters, screwdrivers and a whole lot more. You’ll have 2 of the most common socket sizes and you’ll have a lifetime warranty that lets you know you’re getting something you can count on. 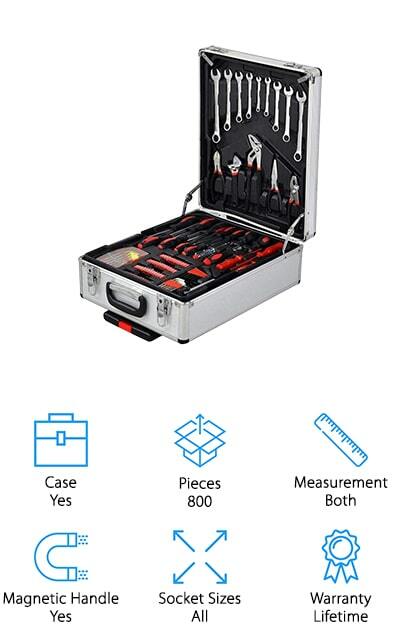 This professional quality mechanic’s tool set even comes with a case so you can take everything with you wherever you need to go. You’ll have magnetic pieces that can help you pick up anything you might drop and you’ll have an inexpensive system that can definitely work for you to get started on your own mechanic work. You’ll even be able to do some basic work around the house.